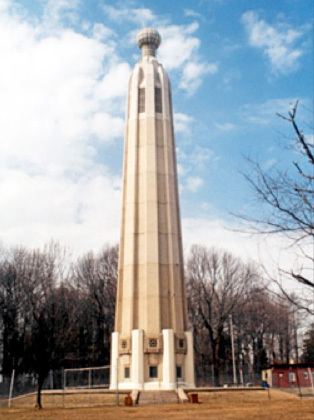 Al Pfingstl sent an update on the Edison Tower in Edison, New Jersey, the site of the inventor’s Menlo Park laboratory. It’s part of the 36-acre Edison State Park, which is also being rejuvenated to include a newly constructed museum (replacing a tiny one from 1947) and outdoor interpretive exhibits. The building contractor has begun interior demolition. The old baseboard electrical heaters, some of which were almost falling off the wall, are being replaced. The original 1940s Men’s and Ladies’ rooms, neither of which met modern requirements for handicapped accessibility, are being gutted. By redesigning the restroom entrance location, architect Alice Deupree with the Jersey City firm of LWDMR & Associates PC, has combined the two original restrooms into one accessible unisex restroom. The existing floor is being removed for replacement with new flooring material. However, an even newer update on the web site notes the uncovering of asbestos. 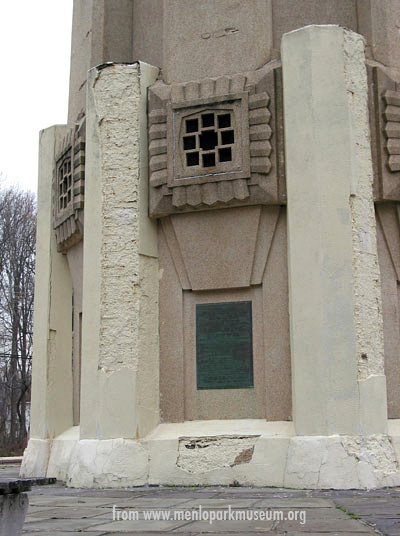 Built in 1937, the Edison Tower now suffers from crumbling concrete and was named by Preservation New Jersey as one of New Jersey’s Ten Most Endangered historic resources. Since 2006, over $3 million has been raised towards the Tower restoration and a new museum. One side of the park fronts the Lincoln Highway/NJ 27 but the tower and museum are accessed via Christie Street. Learn more about them at www.menloparkmuseum.org (source of the image below).